Well, that didn’t take very long at all. 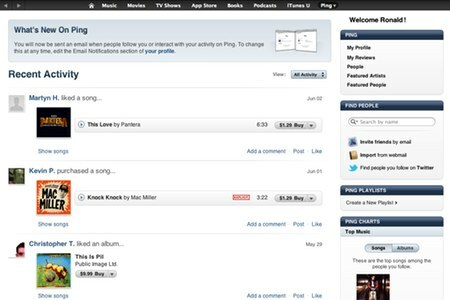 Apple introduced iTunes Ping in September 2010 and now less than two years later it appears that the service will be shut down. With Facebook now firmly integrated into iOS 6, as well as OS X Mountain Lion when it ships in July, Apple is said to be wrapping up its first and only branded stab at social networking. Apparently, the looking is over and the killing is coming in the next big, if not whole number, release of iTunes. All Things D, quoting sources “close to the company,” claims that iTunes Ping is present in iOS 6 but inactive. Further, when Apple next releases a big iTunes, likely this Fall perhaps in conjunction with the release of the new iPhone and iOS 6, Ping will be removed and shutdown.